In the days leading up to Super Bowl XXV, then–New York Giants defensive coordinator Bill Belichick was searching for any weakness the opposing Buffalo Bills might possess. Powered by four future Hall of Famers, Buffalo’s “K-Gun” offense had led the NFL in scoring during the 1990 season and had already posted 44 and 51 points in the playoffs against the Dolphins and Raiders. But Belichick eventually settled on an edge he thought he could exploit: His first job in the NFL had been under the K-Gun’s architect, Buffalo offensive coordinator Ted Marchibroda. While head coach of the Baltimore Colts in 1975, Marchibroda had hired Belichick for a barely paid gig analyzing game film, and the two remained friendly. But this was business, not personal, and Belichick knew that the old-school Marchibroda, though a great tactician, would have trained his quarterbacks the same way he’d once trained his junior film guy: by filling them up with knowledge and then handing them the reins. Analysts wondered how Buffalo’s no-huddle attack could play so fast, but Belichick knew that Marchibroda was forged in an era when quarterbacks like Bart Starr and Johnny Unitas called their own plays, and that Bills passer Jim Kelly had the same freedom. That knowledge was all Belichick needed. Later, Belichick would tell David Halberstam he didn’t think Kelly read defenses as well as some other NFL quarterbacks did, which made Belichick confident he could stay one step ahead. While Marchibroda would be able to explain the Giants’ looks to Kelly between series, during them Kelly would have to match wits with Belichick unaided. With each drive, Belichick made sure to appear to show Kelly exactly what he’d seen the prior series, while in reality making subtle but crucial tweaks, such as replacing a defensive back with a linebacker or changing a single defender’s coverage responsibility to set a trap. Belichick amplified the effect by working out of an unusual dime defense featuring six defensive backs, two traditional defensive linemen, and three linebackers (including Lawrence Taylor) to better defend Buffalo’s talented receivers. It worked. The Giants held Kelly and his receivers in check en route to a 20-19 win, albeit with some help from one of the most infamous missed field goals in NFL history, and today Belichick’s Super Bowl XXV game plan sits in the Pro Football Hall of Fame. Already well known at the time in coaching circles, Belichick became a household name by relying on two of the pillars that continue to define him: ingenious defensive tactics and precision without sentimentality. Twenty-four years later, head coach Bill Belichick is still bombarding opponents with shrewd, coldly rational tactics. The result: His Patriots are making the sixth Super Bowl appearance of his reign, chasing their fourth title. To claim the crown, they’ll have to best the defending champs, a Seattle Seahawks team coached by a man who knows a thing or two about defensive tactics himself. But while Pete Carroll’s otherworldly defenses have succeeded the last few seasons largely because of the way Carroll elegantly uses simplicity to unleash his squad’s great talent, Belichick resists classification. No modern football coach can match Belichick’s deep knowledge of schemes and strategies, or his multidecade track record of applying that knowledge to devastating effect. Belichick’s father, Steve, might be the greatest “scout” in football history, at least based on how the term was used in the 1940s, ’50s, and ’60s. Today, a typical football scout focuses almost entirely on evaluating personnel, like potential draft picks or free-agent signees; in contrast, Steve was an extension of the coaching staffs at Vanderbilt, North Carolina, and particularly Navy, where he worked for more than 30 years for seven head coaches, traveling to watch and analyze opponents’ games in person. Accurately evaluating game film is hard enough for today’s coaches and scouts, who benefit from rewindable All-22 digital game footage; accurately charting and analyzing a team’s personnel, formations, shifts, plays, and tendencies in real time as well as Steve did is almost inconceivable. He was revered for his ability to recognize patterns and spot things no one else noticed, and he compiled his thoughts into lengthy reports that he delivered each week to his head coach, and that also became his son’s introduction to the game within the game. So, by the time Belichick got his first NFL job under Marchibroda at the age of 23, he was already something of a football historian, intimately aware of football tactics and their evolutions. The young scholar soon realized he had a knack for applying that knowledge on the field, quickly rising from an assistant who earned $25 a week to defensive coordinator of the New York Giants by age 33. 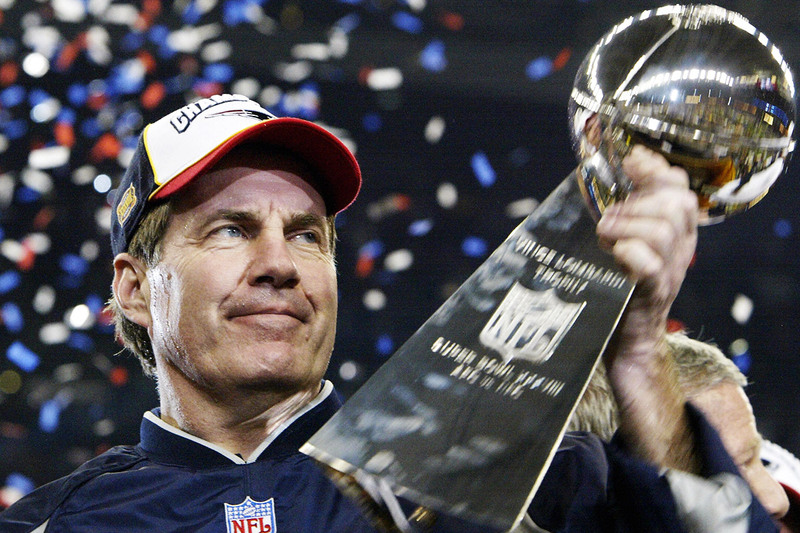 While his father was more of a football theorist, Belichick’s forte has always been applied knowledge. 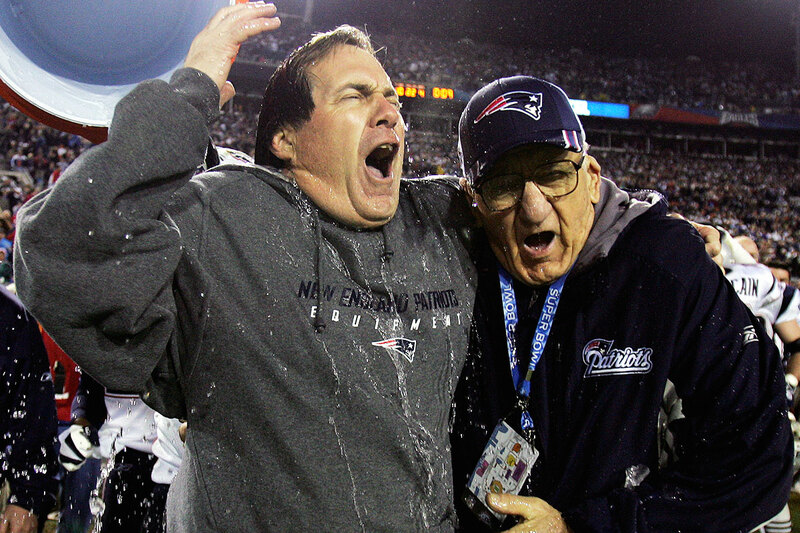 But his father’s influence remained, and Belichick has never stopped learning. He’s renowned for spending his summers picking the brains of coaches he respects in search of anything he might find useful,3 which is why, despite having risen through the ranks almost exclusively as a defensive coach, Belichick is also an offensive master. The Patriots have repeatedly stayed ahead of the curve, going to shotgun spread and no-huddle attacks before the rest of the league, then going back to extra tight ends, fullbacks, and linemen while the rest of the league turned to the spread. The players know who drives these shifts. A few years ago, after yet another parade of offensive assistants had left for bigger jobs, Tom Brady confidently remarked to ESPN that “as long as we have Belichick, I always think that we’re going to be just fine.” So far, he’s been right. Unlike the many coaches who identify with a particular style or tree, Belichick isn’t locked into a singular ideology. He seems to effortlessly shift between tactics from week to week, and he’s always bristled at attempts to neatly characterize his defenses, once calling the notion that he prefers a 3-4 defense a “media fabrication.” For Belichick, there are no pure defensive systems, only objectives and constraints and a hyperrational evaluation of each: “You decide defensively how you want to defend them in the running game. Do you want to defend them with gap control? Do you want to two-gap? Do you want to try to overload the box with extra guys and play eight against seven or seven against six? Those are all the choices you make. With every decision, there’s going to be an upside, there’s going to be a downside. There will be advantages to playing certain things, there will be disadvantages.” This is the kind of multi-tiered thought process Belichick calls “pretty straightforward.” Right. Thanks to that mentality, Belichick’s greatness has never stemmed from the Big Idea, unless the Big Idea is the relentless application of many Little Ideas. For example: With the Giants, one of Belichick’s best tactics was something he called BTF, or Blitz the Formation, an idea he gleaned from Buddy Ryan’s famed 46 defense with the Chicago Bears. 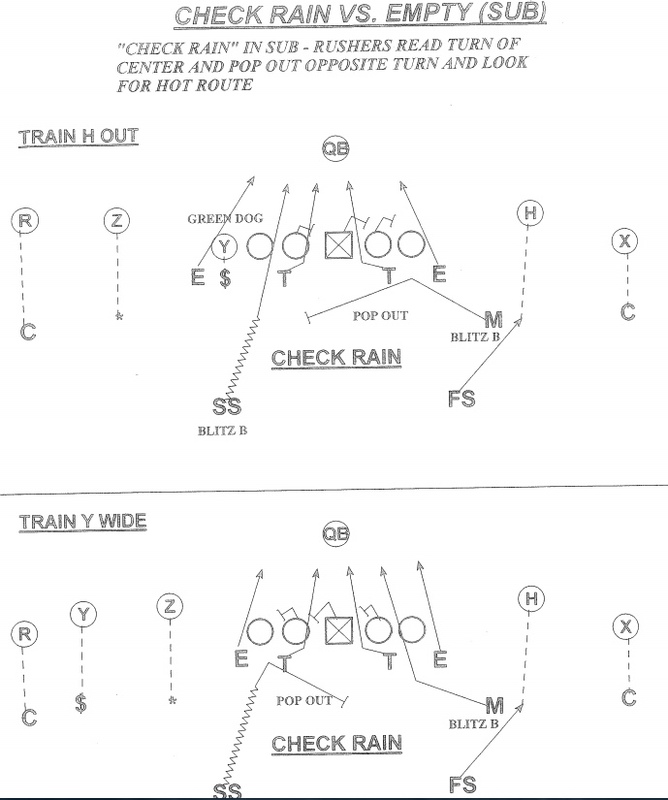 Instead of calling for specific players to blitz the quarterback, Belichick would make a BTF call, and once the offense showed how it was lining up, his players would check to a specialty blitz designed for when that particular opponent used that particular formation. In recent years, however, Belichick has expanded on this idea by having his players adjust their blitz assignments not only based on the offense’s formation, but by having them trade assignments after the play begins. On most NFL passing plays, the center is usually the key to understanding how the offense is trying to protect the quarterback. Defenses prefer to rush away from the center, which creates a mismatch in favor of the defense by forcing the running back to block a blitzing NFL linebacker (and also eliminates a potential receiver out of the backfield). If the running back isn’t staying in to block, or if he is but whiffs, the defense has an unblocked blitzer, which is even better. In Week 16, with the Patriots clinging to a 17-16 lead with just more than six minutes left, the Jets faced third-and-4 from New England’s 24-yard line. Just before the snap, New England’s entire defensive front shifted, as defensive tackles Vince Wilfork and Chris Jones moved inside and linebackers Jamie Collins and Dont’a Hightower — the defenders Belichick had designated for a tag-team “Rain” blitz — moved just outside the tackles. As the play began, New York’s center slid to his left, so Collins dropped back, right into Geno Smith’s throwing lane, while Hightower flew into the backfield and sacked Smith for a 10-yard loss. With the ball pushed back, Wilfork blocked Nick Folk’s 52-yard field goal attempt, the Jets failed to threaten to score again, and Belichick notched another victory, once again subtly and masterfully upending his opponent. It’s hard to win in the NFL, where most games are decided by small, often overlooked moments. The great coaches, however, are adept at finding and exploiting seemingly infinitesimal advantages. There’s a reason Bill Walsh called his book Finding the Winning Edge and Don Shula called his The Winning Edge: Gaining an “edge” is often the difference between winning and losing. One doesn’t steward his team to 12 consecutive 10-plus-win seasons, as Belichick has, without an uncanny ability to identify and exploit the on-field edges that add up to wins. But what about edges off the field? 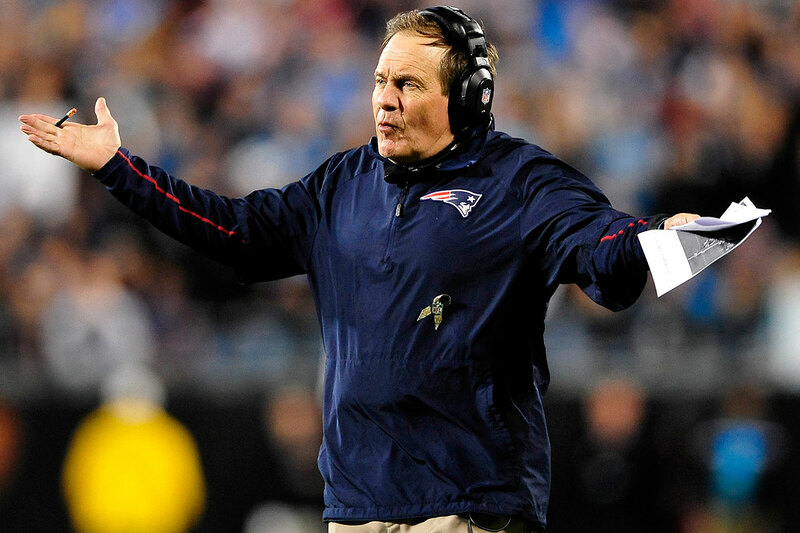 It’s impossible to write about Belichick this week without raising the question. Like almost all of his peers, Belichick isn’t above a little gamesmanship if it might help him win: According to Halberstam, in order to slow down Buffalo’s no-huddle offense in Super Bowl XXV, Belichick told his Giants players to “accidentally kick the ball” away from the officials after it had been set up for play. But there’s a difference between gamesmanship and breaking the rules. We all know about Spygate, and Deflategate has dominated the headlines in the lead-up to this Super Bowl. Still, it’s hard to know quite what to make of this latest “scandal.” Considering it’s about whether someone intentionally took air out of some footballs, it’s easy to say the story’s magnitude would have been considerably less had it not involved the Patriots and Belichick. That’s not to minimize the allegations — rules are rules — but instead to say that the idea of Belichick surreptitiously leaking air out of footballs to try to gain an advantage for the Patriots perfectly matches the popular narrative of Belichick as a callous detail-freak. In fact, for many, Belichick’s defense that he’d never really thought about the air pressure of a football during his 40 years of coaching was the most unbelievable part of this entire saga. Belichick thinks of everything. Every generation seems to get the football coaches it deserves. In the postwar decades, leading coaches like Paul Brown, Vince Lombardi, and Woody Hayes were imperial figures defined by discipline and a militaristic approach to the game. In his book, the elder Belichick made sure to always refer to the leader of Navy’s chief rival, legendary Army coach Earl Blaik, as “Colonel Blaik.” Nowadays, most NFL coaches are company men, professionals who started as trainees and made their way up to corner offices by working hard and “managing up” the same way they would have at General Electric or Goldman Sachs. The exception, as always, is Belichick: Compared to his peers, he’s far less polished (David Letterman once said he looked like a “Sherpa guide”) and far less concerned with sentiment (Parcells used to refer to him as “Gloom”). But he’s also more knowledgeable, more rational, and more exacting. Belichick is a grim, calculating technocrat. But he’s also the best coach we have. Belichick has even credited his high school coach, sharing his philosophy with Halberstam: “The coach was king, and had been king in the past, and was going to be king in the future.” Sound familiar? That includes spending time learning the finer points of the triple option from then–Navy head coach Paul Johnson, something it’s tough to imagine any other sitting NFL head coach doing.